An unlikely couple is paired at a summer house party. Their budding friendship is cut short by a horrid accident. Will they be able to find love through tragedy? Charlie Bittlesworth was invited to a summer idle, and hopes to use the time to sell some of his premium livestock. He thinks it a small matter to pay some kind attention to the cousin of his hostess. Charlotte Ayres has been cloistered in her father’s academic circles at Cambridge all of her life. She feels out of her element at her cousin’s estate, but has never met a man quite like the one she is paired her with for her stay. 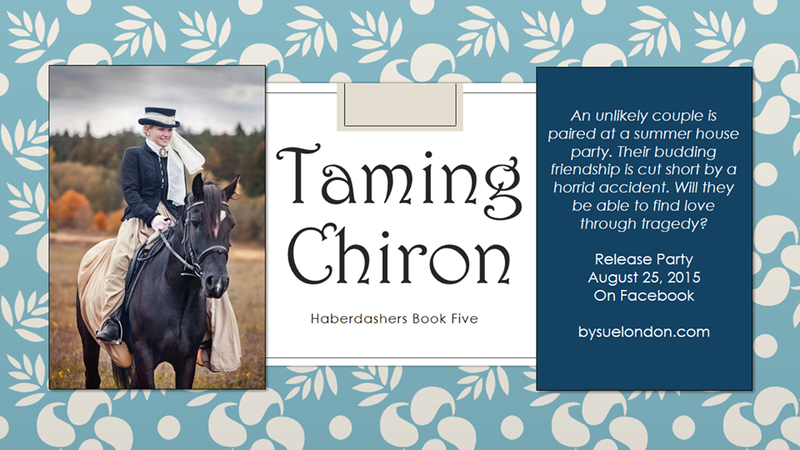 Pre-purchase Taming Chiron from the author via PayPal, or sign up as an ebook ($1/month) or paperback ($5/month) level Patron to receive early releases. Expected release August 2015. Facebook party planned August 25th.